To create a positive image of Lyari through contents to inspire and recognizing, fostering and promoting the talent of locals. Hamara Lyari is a website to create a soft image of Lyari. Syed Nadir with his team of Shehzad and Obais came up with a unique idea of making a platform for young and talented people of Lyari to come and show their hidden and neglected talents to the world. Lyari, which was once called the mother of Karachi, had been in the news for a long time for criminal and gang activities. The media had been focusing on showing the people that the only thing existed in Lyari was the gang war and other bad things like drugs. Due to a mass amount of literature declaring Lyari as a war zone, we forgot that once Lyari has been center of education, sports, literature, and politics. This has left a lot of psychological effects on youth. A long tenure of exposure to gang violence has left them stoic. Luckily after some operations and betterment of law and order situation, Lyari is coming through a phase of being normal and peaceful again. But still, there are a lot of misconceptions about Lyari among people of Pakistan. 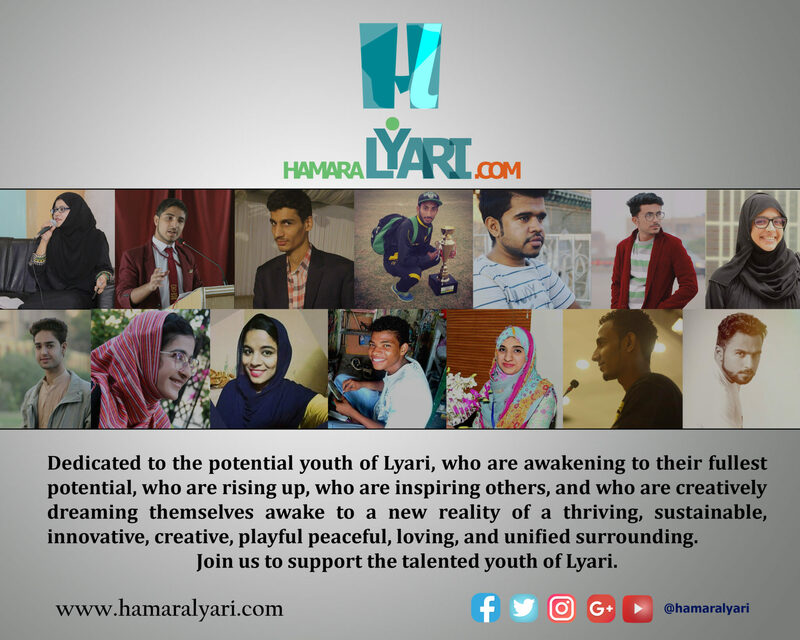 With the launch of this website, we strive to bring back the real and positive image of Lyari through highlighting the talent of youth and contribution of stakeholders. Lyari besides being famous for sports activities has also been the hub for literature. Many of literary works trace their roots back to Lyari. Lyari has given Pakistan a lot of treasure like Syed Sajjad Hussain Shah, who has been Chief Justice of Supreme Court of Pakistan was born in Lyari. By this website, we aim to give those youngsters a real platform which is for Lyariite by Lyariite. We encourage the youth of Lyari to come and use our platform for showing their talent and contribution so far they have done in various fields to the people of Pakistan to change their perception about Lyari and the residents of Lyari.